Noah was almost a year old when we adopted Nala from the Boulder Humane Society and they instantly bonded.We would take them to the mountains when we went skiing and they drove home to Texas with us for every holiday. They loved exploring new places like the park or whatever new house we would take them to. They had every toy possible and went everywhere with us. They had us wrapped around their little paws from the beginning and they knew it. Noah was the smaller of the two but he was in charge and very protective of his little "sister" Nala. 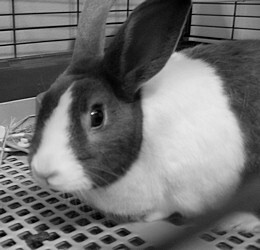 She was definitely more timid and always knew Noah would look after her.While we had some great times, including many NTRS events that they joyfully attended, my favorite times spent with the bunnies were those when we weren't doing anything. Watching them doing their jumping kicks of joy or just laying with them getting bunny kisses are the times I miss the most. Nala crossed the rainbow bridge on August 8, 2008 and was soon joined by Noah on October 19, 2008. It was his birthday and I truly believe all he wanted was to be with his Nala again. They are both dearly missed and our lives are forever blessed because we had the opportunity to love and be loved by the two most precious and spirited companions we have ever known.